Most of the media is getting their hands on the iPhone 4 for the first time. So what do they think? The screen seems like the biggest standout feature, but then again, no one could really test the camera. "As a person who never really liked the round mound of a back in the 3GS, the sleeker, flatter, squarer design is super welcome. It feels sturdier than the 3GS, and much less plasticky. The metal buttons give it a heftier feel-less of a toy-than all previous generations. The closest analog to it would be the original iPhone, which is more square and heavy than its newer brothers." "We'll hand it to Apple, the phone is so thin it's kind of mind-boggling. The 3GS by comparison looks bloated." "Fingerprints on both sides, sigh." "We especially dig the all-white version, which looks totally unlike the last white iPhone that was sold or really, any other phone on the market. In fact, something about the combination of its finish, shape, and color actually reminded us of some of the all-white phones we saw on the subways of Seoul, when we visited a year ago." "It feels solid. Also: the screen resolution makes it very easy to read. Other than that, it works like an iPhone." "...the first thing I noticed was how dense the pixel count is on the screen. Comparing Apple's weather icons on the iPhone 3GS and iPhone 4 make it very apparent how much better the screen on the 4 actually is." "The new Retina display is indeed impressive...the display on the big monitors in the hall looked great as did the phone when I held it in my hand." "All the demo models were running iOS4, which works extremely well. Multitasking works as expected - double tap the home button to bring up carousel of apps to switch to." "As for speed, the iPhone 4 is fast. 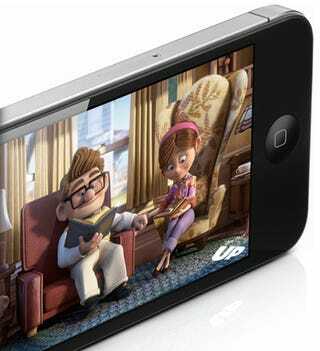 It's hard to perceive the differences between an iPhone 4 and iPhone 3GS, but it's definitely on the speedy side, on par with the iPad." "The iPhone 4 is very snappy when using apps. For instance, switching between the front-facing and rear cameras is instantaneous. I dare say if you tried that with the 3GS you would see some delay." "FaceTime is a button accessible through the Phone app. Unfortunately the Wi-Fi in the press room was flimsy, but when we connected for a few seconds, it was pretty fun. Apple hasn't yet disclosed the resolution of the front-facing camera, but the video we saw on-screen looked decent for chatting." "Tthe iPhone 4 feels like a winner. It's eye-catchingly thin, stylish and modern, and hardware upgrades like the screen and processor give the makeover some heft. You'll want one. Everyone will want one."